Lassen County has a unique way to say: "We're done with you stargazers!" Taken on Sunday morning on the last night of the Golden State Star Party. The lightning started in the distant south, too far to hear. 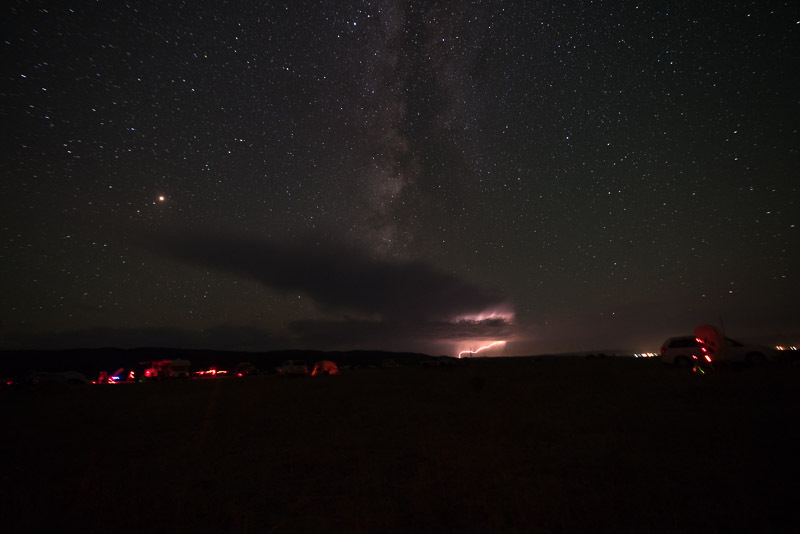 How often do you get the chance to see stars and lightning at the same time? I decided to take some long exposures with the Pentax K-1 and the Irix 15mm lens. By using the Astrotracer function on the Pentax camera, the star trailing was stopped for this long duration exposure. Note the movement of the terrestrial lights on the horizon. Just after this picture, I reviewed the sequence of shots I'd already taken and thought: "This storm is coming straight at us!" At that point, I decided that I was done imaging and it was time to pack my gear. For the next hour until 4 am, I shut down the scopes, coiled cords, packed up tripods, folded my cot and sleeping bag (I'd already taken down the EZ Up and tent earlier in the day). Lightning was flashing constantly as the storm got closer. Not a fun thought to consider being out in the open on a flat field, nothing taller than me (excepting the one radio astronomer with his 20 foot tall antenna). By the time civil twilight started, I was able to settle into the passenger seat of the prius with several hungry mosquitoes to keep me company. Woke at 7 when the rain started pouring and just waited for a break so that I could get on the road. Nice way to end GSSP this year. During this year's effort, I was able to get some more data on LDN 673, first light on a widefield setup, and do a bunch of film work. Tried Portra 400 and 800 after shooting E200. No black and white done this time, will save that for Calstar.